This double duplex switch is an economical alternative to control 2 of our Infratech, 240 volt, DUAL ELEMENT, heaters, with up to 8000 total watts each (4000 watts per element). 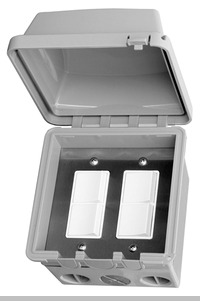 Each duplex switch consists of 2 smaller switches, one to turn each heater element on or off. That provides Off, Half Power, or FULL Power control. It includes a weatherproof gang box and cover. Systems can be controlled with simple, value-priced, input regulators (to 3000 watts per element / 2 element heaters to 6000 total watts); duplex switches with "On/Off/Half/Full" functionality (for dual element WD series heaters to 8000 total watts); or sophisticated, solid-state controls for infinite control of larger heating systems (to 36,000 watts) or systems with more complex zoning requirements (to 9,000 watts per zone).